An artist learns the importance of things unseen as she gets to draw a stranger’s portrait. Regardless of whether that anecdote is true or not, I like it’s implication—this idea that profound emotion can often be expressed in simple and brief ways. Heck, it’s why I’ve spent so much of the last five years watching and writing about shorts. All of this is essentially a long-winded introduction to Karis Oh’s The Moment—a film that despite its scant two and half minute runtime packs quite an emotional punch. Largely, The Moment is a film predicated on a twist. While I won’t spoil it here, it’s a turn that largely worked for me. Yes, it’s intentionally emotional. And, yes, in the wrong hands, a similar plot point could have felt akin to one of those sappy e-mail chains that your Great Aunt keeps forwarding you. But, fortunately, Ms. Oh’s hands are the right ones. She lovingly weaves a tale about the human condition, bolstering the emotion on screen with a lovely sense of aesthetics. This is a short about appreciating the world around you—not just on superficial level, but to truly, non-ironically experience wonder. Again, that’s a message that could have easily been cheesy. But, here, with the film’s tranquil tone and painterly aesthetic, Oh crafts something that feels quite resonate. 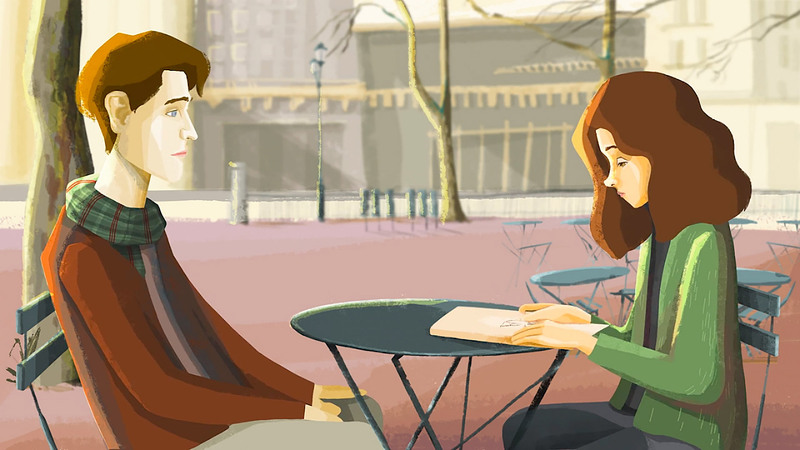 The Moment is Oh’s senior thesis film from School of Visual Arts (SVA) in New York City. It took her almost 2 years to create, from the initial scripting through the final animation. Everything was drawn and animated in Photoshop and After Effects. You can check out some behind the scenes sketches on her website. The film has already been staff picked by Vimeo and has been enjoyed by thousands. Just don’t be surprised if it shows up in an e-mail from your Great Aunt a few months down the line—she always has the best inspirational forwards.